Thorough and meticulously researched, this study is based on a comprehensive reading of philosophical arguments drawn from all the major Jewish sources, published and unpublished, from the Geonic period in the ninth century until the dawn of the Haskalah in the late eighteenth century. The core of the book is a detailed discussion of the four doctrines of Christianity whose rationality Jews thought they could definitively refute: trinity, incarnation, transubstantiation, and virgin birth. In each case, Daniel Lasker presents a succinct history of the Christian doctrine and then proceeds to a careful examination of the Jewish efforts to demonstrate its impossibility. The main text is clearly written in a non-technical manner, with the Christian doctrines and the Jewish responses both carefully explained; the notes include long quotations, in Hebrew and Arabic as well as in English, from sources that are not readily available in English. 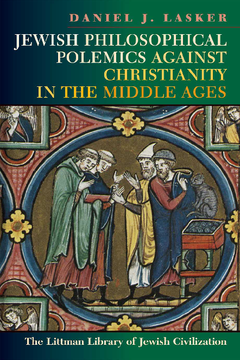 At the time of its original publication in 1977 this book was regarded as a major contribution to a relatively neglected area of medieval Jewish intellectual history; the new, wide-ranging introduction prepared for this paperback edition, which surveys and summarizes subsequent scholarship, re-establishes its position as a major work. Daniel J. Lasker is Norbert Blechner Professor of Jewish Values at Ben-Gurion University of the Negev, Beer Sheva, and is chair of the Goldstein-Goren Department of Jewish Thought. His books include Jewish Philosophical Polemics Against Christianity in the Middle Ages (1977), The Refutation of the Christian Principles by Hasdai Crescas (1992), and, with Sarah Stroumsa, The Polemic of Nestor the Priest (1996). How Could the Body of Jesus Enter Bread? How Could Jesus’ Large Body Fit into Smaller Dimensions? How Could Jesus Pass through the Heavens Without Damaging Them? How Can Accidents Be Without Subjects?